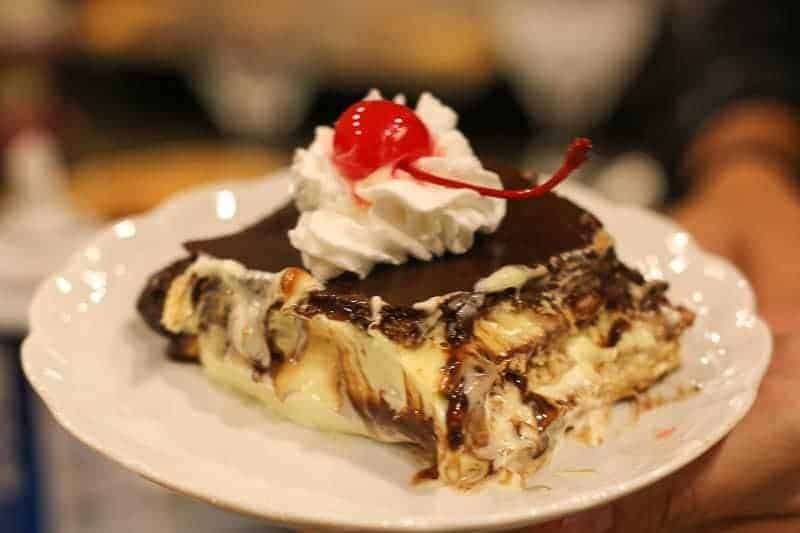 This Chocolate Eclair Cake Recipe is an easy signature no-bake dessert for family gatherings, cookouts, and parties. It is absolutely delicious. This Chocolate Eclair Cake is made of layers of a creamy pudding mixture and graham crackers, then topped with a rich, crackly, homemade chocolate frosting that will make your heart sing. 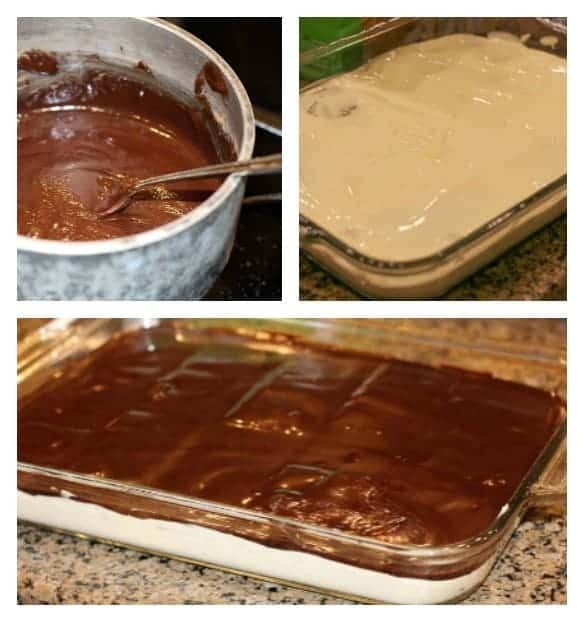 I made this Chocolate Eclair Cake Recipe for one of my recent cookouts. This eclair dessert has been a family favorite for years. Because it is so easy, it is a perfect homemade dessert when you are making a lot of food and don’t have time for anything fussy. There isn’t one person I know that hasn’t liked it. It has a creamy pudding filling in between layers of graham crackers that is topped with an AMAZING chocolate frosting. The frosting is a gooey, sweet, chocolatey sauce that Willy Wonka would be sure to love. I mean… the frosting is the real excuse to make this folks… the dessert is just the tool to eat this stuff on with a little dignity. 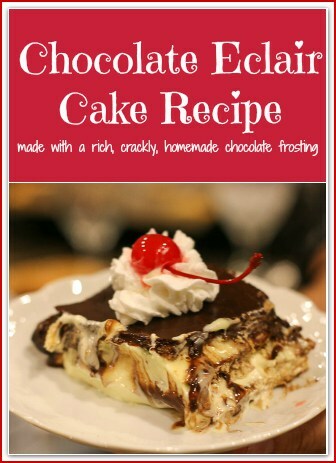 Making Chocolate Eclair cake is so easy! First you make the chocolate frosting on the stove top. Cool and set aside. Next you make the pudding filling. Then you place one layer of graham crackers on the casserole dish. Then you layer half of the pudding filling. Then you add a second layer of graham crackers and top with the remaining pudding mixture. Then you top with one final layer of graham crackers. The chocolate frosting is then spread over the top layer of graham crackers, then refrigerated overnight. 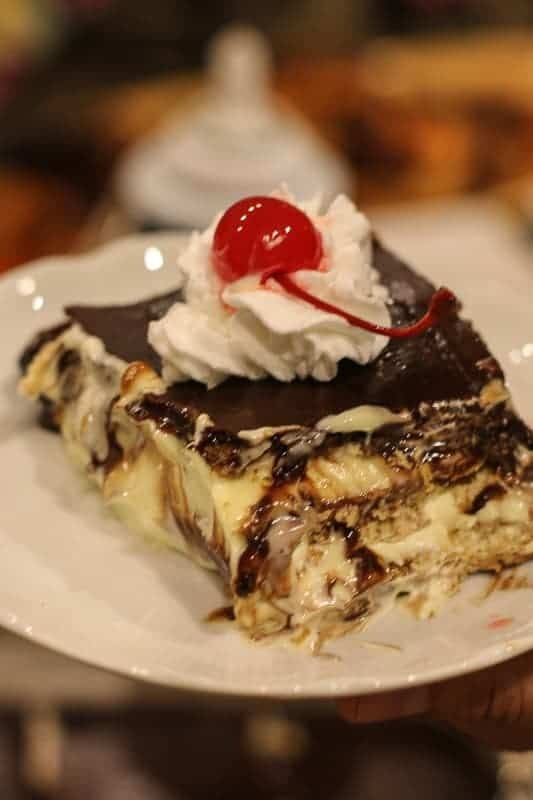 When I made this chocolate eclair cake for my friends, they ate it in a matter of minutes. The whole dessert dish just completely disappeared. They loved it. Therefore, I didn’t get the best pictures. I managed to steal some pics of this slice before it got away. If you look at the picture above, you can see what I mean about that AMAZING, crackly, fudgy, chocolatey frosting. It is a gooey, yummy mess. While, my pictures are not so good… this no-bake dessert recipe IS too good not to share. You guys are my peeps. I love you. I share my favorites with the people I love! You are welcome! Enjoy. Just don’t get mad at me about the calories…. I am not responsible for calories or sugar intake on this. Eat with your own risk! If you like this recipe, check out: Mexican Fried Ice Cream, Strawberry Cream Shortcake, Easy Southern Banana Pudding. If you are looking for a Sugar Free no bake dessert, check out Low Carb Maven’s Low Carb Chocolate Lasagna Dessert! This Chocolate Eclair Cake recipe is made of layers of a creamy pudding mixture and graham crackers, then topped with a rich, crackly, homemade chocolate frosting that will make your heart sing. Prepare pudding according to directions using only 3 cups of milk instead of 4. Stir in cool whip or homemade whipped cream. Place a layer of graham crackers on bottom of 9x13 pan. Layer half of pudding mixture over graham crackers. Place another layer of graham crackers over pudding mixture. Layer remaining pudding mixture over graham crackers. Top with final layer of remaining graham crackers. Combine cocoa, milk, and sugar in a stove pot and bring to a full rolling boil; boil about 1 minute, stirring very frequently. Remove from heat and cool one minute. Mix butter and vanilla with the cocoa mixture; stir until butter is melted. Pour chocolate sauce over the top layer of graham crackers. Spread evenly to completely cover graham crackers. Refrigerate over night to allow frosting to set. You’re killing me with this recipe, Katie! It looks absolutely delicious. Thanks for sharing. Now THAT looks decadent! The best recipes are always the ones that get away too quickly to get killer photos of, but in this case, your photos do a great job showing how gooey and delicious this is. Yum! This looks delicious! I would love to try this recipe! Wow, wow, wow, I am in love with this cake. Looks like I need to start cracking and make this treat! Looks delicious, love this great for party. 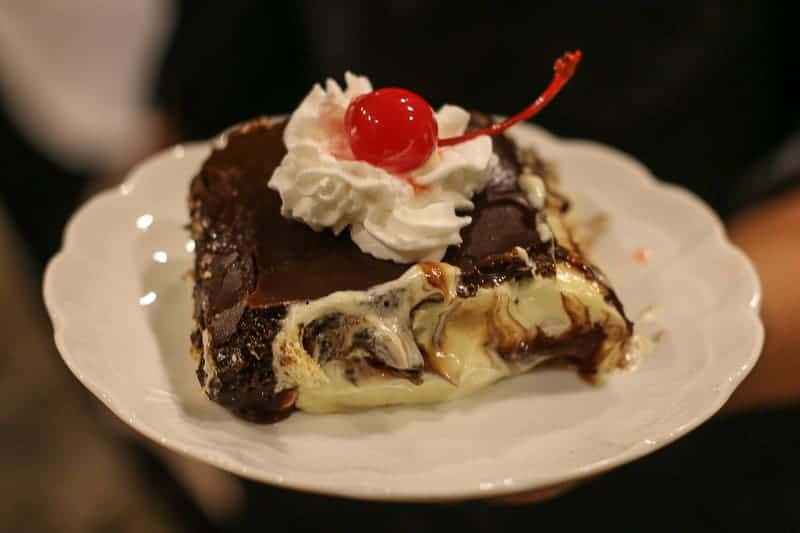 Mighty beautiful Eclair Cake recipe you got there. One of my very favorite dessert. A must try recipe!